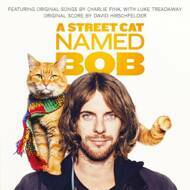 Homeless and a recovering drug addict, James Bowen (Luke Treadaway) is running low on his luck and finds a ginger cat at his home. From that point onwards, the two lives become entwined. Roger Spottiswoode's English feature is based on the bestselling novel "A Street Cat Named Bob". After their story was published in a local newspaper, Bowen was offered a book deal in 2010 and has since published six bestsellers detailing his life and travels with his ginger cat. Bob has also become something of a celebrity in his own right, receiving the most fan mail of any Hachette author and boasting 72,000 followers on Twitter. They cast multiple cats to play Bob but in the end, Bob played himself for most of the film. Charlie Fink has written six original songs especially for the film, all of which feature on this soundtrack. He is a British singer-songwriter, producer and filmmaker and is best known for fronting the indie band Noah and the Whale. The songs have prominent placement in the film and are sung on screen at key moments in the story by the main protagonist James, busking on the streets of London.